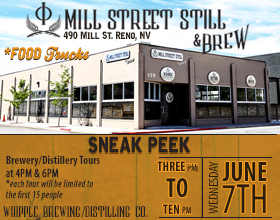 All craft beer enthusiasts near and far will gather in the Freight House District at Greater Nevada Field for a day of beer, competition, and a whole lot of reward. Backwash, the charitable event for Project Great Outdoors, kicks off Reno Craft Beer Week at 6 p.m. on Friday, May 13. Project GO (projectgo.org) is an organization of volunteers whose purpose is to offer their skills in navigating nature’s challenges to help troubled youth become a little less troubled. All direct services to youth are carried out by trained volunteers which adds up to a couple thousand volunteer hours per year. While the volunteers give a great deal to the organization and the youth they serve, they find the volunteers often get as much, or more, out of the experience. Backwash itself is not an event to be missed. Craft brewers can sign up and enter the best authentic pint they can home-brew. People will be able to have a tasting of each selection and cast their vote for the People’s Choice Award for best brew and a healthy cash prize The Brewers Choice winner is honored with the opportunity to be the featured brew at The Silver Peak. Brandon Robinson was last year’s Brewer’s Choice winner with his home-brew of Pine Rye-dr American IPA. Robinson started his home brew last month for this year’s competition. A VIP Ticket for $75 get you early Entry at 5 p.m. preferred seating and and extended menu in Bugsy’s Sports Bar & Grill. You’ll get an all you can eat BBQ feast and a beautiful imprinted tasting glass. Sponsors are still being accepted! Visit http://www.backwashreno.org/homepage/sponsorship/ for more information on how you can become a Pint, Pitcher, or Growler level sponsor.